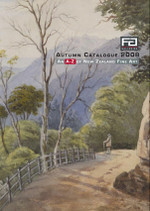 An A-Z of New Zealand Fine Art: covering 120 years of New Zealand painting. Acclaimed artists William Mathew Hodgkins, JBC Hoyte, Frank Huddleston and E. Mervyn Taylor feature alongside artists whose names may be unfamiliar to some collectors: Edith Collier, who worked alongside Frances Hodgkins; Frederick Vincent Ellis, who was a veteran of WWI and was also a highly influential teacher in the NZ art world; and relative newcomer Geoff Tune, an Auckland artist, whose work challenges perceptions of modern art. Other artists featured in this catalogue include Helen Brown, Freda Simmonds, Emily Jackson, Trevor Moffitt and the late Colin Webster-Watson.